Pioneers in the industry, we offer coloured pebbles, rainbow pebbles, multicolored aquarium pebbles and colorful aquarium pebbles from India. We offer to our clients superior quality Colored Aquarium Pebbles. 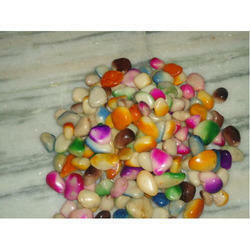 Due to high quality and durability these Colored Aquarium Pebbles are famous amongst their user. These Aquarium Pebbles are available in market at most economical rates. Our Aquarium Pebbles are highly appreciated by our clients. 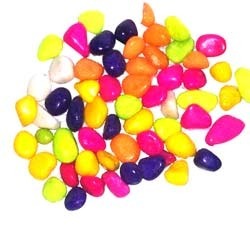 We offer Rainbow Pebbles that are available in seven colors of rainbow. Each stone is shaded and colored in rainbow pattern which makes it look different and am zing in water. It is resistant to fungus and algae and stays in the same quality in water for much longer period. In addition this, these are provided in safe packaging and in variety of sizes, shapes and colors so that our clients can customize the product as per their need. 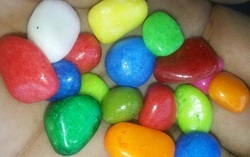 We have emerged as a leading firm offering Coloured Pebbles to our clients. 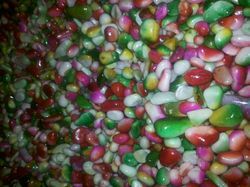 We make use of the best color and polish to process these pebbles at our infrastructural unit so that we can meet the variegated specifications catered from the client. These are made in compliance to set industrial standards and are widely appreciated for it's quality by our esteemed clients. Our clients can avail the product in most affordable price range. 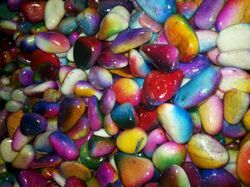 Used widely in hotels, restaurants, homes and such places, we offer Colorful Aquarium Pebbles for aquariums to decorate them. These are durable and are crack resistance as well. These does not change in water as well. The manufacturing process done at our state of art infrastructure is supervised by our highly skilled professionals in order to provide the best range to our prestigious clients. Price range is convenient for clients. 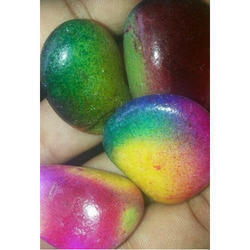 Looking for Multi Colour Aquarium Pebble ?